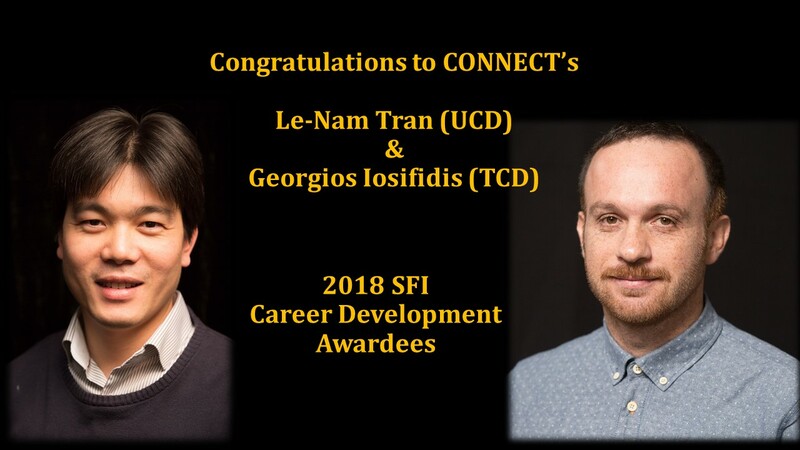 Congratulations to Georgios Iosifidis, CONNECT Investigator at Trinity College Dublin, and Le Nam Tran, CONNECT Investigator in UCD, on receiving SFI’s 2018 Career Development Awards. They are among 22 early career researchers who will receive €13.7 million designed to support the next generation of talent in Irish research. From augmented reality applications to the Internet-of-Things and mobile data analytics, a plethora of services today change fundamentally the way we communicate with each other and interact with our surroundings. These developments, albeit exciting for the users, raise unprecedented challenges for wireless networks, hence calling for a paradigm shift in their design. SoftEdge proposes a new class of system architectures, aiming to harness resources at the edge, i.e. close to demand. Therefore, it will enable mobile operators and service providers to deliver high-quality communication and computing services to the users in an economically efficient and environmentally-friendly fashion. In this project we will develop holistic approaches to solve the energy crisis and security concerns in wireless networks. Nowadays, the global ICT industry consumes more than 10% of the world’s energy. Data transmitted wirelessly can be easily intercepted by eavesdroppers. Today’s wireless systems are far from addressing these timely problems. In this project we will apply advanced mathematical tools to derive efficient algorithms to reduce energy consumption, and to secure data privacy. The research team will draw on large-scale deployment of low-power nodes equipped with some decentralised mechanism and unique fading characteristic of wireless channels to provide data security.